Joymount PW presents The Crafted Revelation – 30 scenes from the Bible depicted in craft. 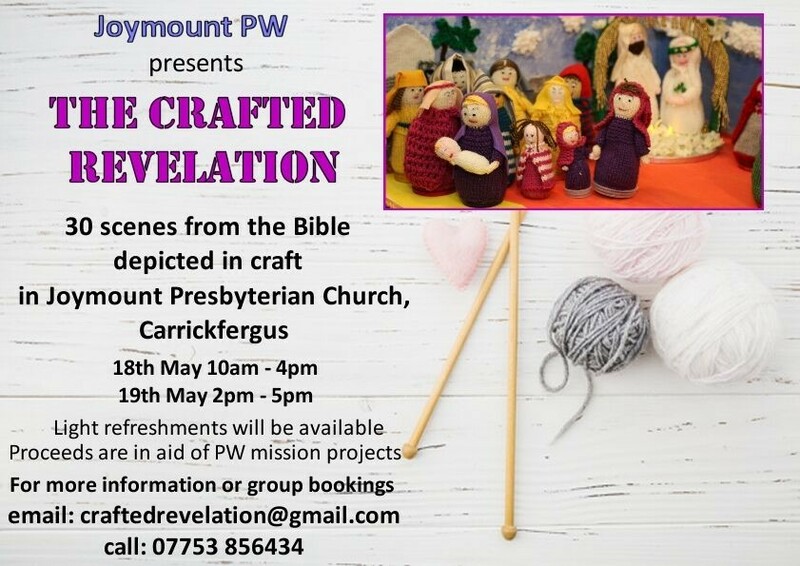 On the weekend of Friday 18th and Saturday 19th May 2019, the PW group at Joymount Presbyterian Church in Carrickfergus are holding a craft event with a difference. Thirty scenes from the Old and New Testament will be depicted in craft displays throughout the church. As well as knitting and crocheting, the scenes also incorporate stitching and woodwork. Joanne Magee from Joymount told The Church Page: “The event is titled The Crafted Revelation as each scene will demonstrate how God has revealed himself through the stories in the Bible. Visitors will be guided through Bible times, starting with the creation and will include Old Testament characters such as Noah, Moses, David, Daniel and Jonah. The New Testament starts with the nativity and leads through Jesus life, death and resurrection and also the work of Paul. The journey will finish with a view of Revelation and a scene depicting our church today. The Crafted Revelation at Joymount Presbyterian Church, Carrickfergus. The event is open to all and will run from 10am to 4pm on Saturday 18th May and 2pm to 5pm on Sunday 19th May. Light refreshments will be available in the church hall. The weekend will finish with a praise service at 6:30pm on the Sunday evening. Donations will be welcomed and will go to the PW Mission Fund supporting work at home and overseas. You don’t need to be a crafter to enjoy this. It will be a fun weekend for everyone with a special quiz sheet to accompany the scenes available for younger visitors. If you would like more information on the event or would like to come as a group, please contact Joanne Magee by email at craftedrevelation@gmail.com or by telephone at 07753 856434. It’s going to be busy at Joymount Presbyterian. They also have an Auction taking place in the church hall on Friday 26th April 2019 starting at 7pm. Viewing on the day starts at 5pm. All money raised from the Auction will go to church funds. Everyone is welcome to come along. Joymount Presbyterian Church is located at Joymount, Carrickfergus BT38 7DN. To discover more about the church, visit their website here.